For “myNesteEgg retirement calc” related questions, you can email us at minjie dot xu at gmail dot com; or uudaddy at gmail dot com. The app itself is quite self explanatory. Here is the link to iTunes App store. Please note the only thing collect is the email address (optional, if the user signs up). Also note do we don’t share any information with other 3rd parties. Again please feel free to contact us at the email I listed above. Note (09-04-14) I found that I made a mistake on the latest version 1.5.6, I just submitted the fix to the app store (v 1.5.7). Update to support iOS 7; add log in option so that the user can track his/her savings across devices; the app runs on iOS 6.1 or higher. 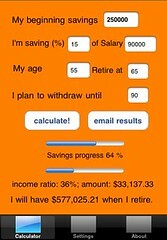 Add AutoPilot option, in which the income ratio is set to 70%, and the app calculates the saving rate from other user inputs. Fixed the “data not being saved” issue on iOS 4 or newer. Add rules (under “ToDo”); add review reminder. Fixed the calculation results not right due to the extra comma separator in “beginning savings” and “salary”. Set default inflation rate to 2% (was 1% before the change); set default investment return rate to 7% (was 6% before the change). We believe the new numbers are more realistic numbers. The real return rate remains the same 5% (=7% – 2%): the calculation results will not be affected either. Retirement planning at finger tip. We believe retirement planning should be available and simple (easy to use) for everyone, with or without access to good financial advisors/planners. 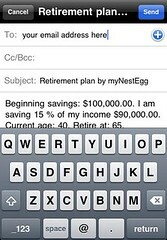 myNestEgg is an iPhone (iOS 3.1.2 and above) app that tracks your personal retirement savings account (in the United States, that usually includes 401k and IRA, or commonly referred as nest egg). It helps you calculate how much you have saved (Saving progress), and how much you will get annually from your IRA/401k after your retirement. It also compares the post retirement annual income to your current income (Income ratio), so that you will have a feeling regarding how your post retirement living standard will be compared to what you have now. Besides calculating those results, the user can also set the annual investment return rate, inflation rate, or optionally email results to self. This app allows the user to set “regions format” to her/his country/region, and the local currency symbol will be shown in the calculation results. *Note: in the following instruction, sometimes I used “click”, it really means “touch” on iPhone. When the application starts, the input text fields has some pre-filled data. Touch on a text field will bring up the iPhone numeric keypad. Clear value in text field using the “delete” button before put in new values, this way we can make certain the input values are valid. After you are done with all the input data, click on the background orange area to dismiss the keypad. So that you can see the calculate button (see below). Click on the “Calculate!” button, and you should see the results. As we can see from the 3 scenarios from above, the earlier you start to save regularly for your retirement, the more you will have in your nest egg. The default setting is good enough for most people, however, if you want to change the investment return and inflation rate, you can do it. You set the rates by select the investment return on the left picker, (optionally) select the inflation rate on the right picker, then click the “Set rates” button. 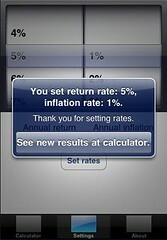 A dialog will popup to remind you the new rates, just touch to dismiss the dialog. After setting those rates in “Settings” tab, it will automatically re-calculate when you click the “Calculator” tab again. Investment return: the default value is 6%, I think 6% is a reasonable rate for a diversified stock focused portfolio. 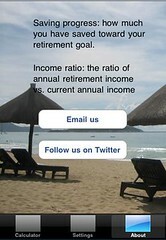 Notice I set the post retirement investment return = investment return rate before retirement – 2%. This is fixed because I believe retirees will usually move more toward bond focused portfolio with slightly lower return. Inflation rate: the default is 1%. Here is an example of setting rates, continue to use the 40 years old case, the only change is investment return from 6% to 5%, note the difference of post retirement income : ratio (62% to 47%) and annual income (changed from $56,449 to $42,452). This is meaningful difference. Meanwhile, we should keep in mind, as the rate of return goes up, usually the risk or volatility could also go up. 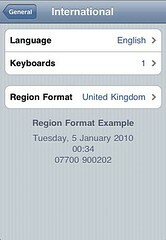 This is not specific to this app, but you can set “regions format” from iPhone settings => General. After that, the currency will be in your native format, for instance, pound for UK. The words are still in English. Currently the app saves the inputs to local file system, if the user completes calculation at least once and quit the app via the iPhone home button. 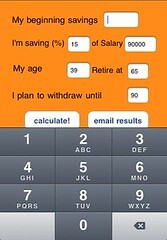 The next time the user launches the app it will pre-fill the calculator with the input data she/he used last session (the last retirement calculation). This functionality saves some work typing in data, and help the user keep track of retirement planning sessions over the time. 1. Where is the background of the “About” page (tab)? 2. How about annual income growth, say a salary raise? Did you miss it? Here is my thoughts. Good point, but I am not optimistic about this (except for entry level employees) in the foreseeable future especially in the US. For middle level and higher employees, I would not count much on the real income growth (I mean the raise offset by inflation). That being said, I am open to suggestions on this and I may consider add this to settings in future release. 3. Why limiting the investment return rate between 4% to 8%, and inflation rate between 1% to 5%? Is that too restrictive. I am no economist but I believe those are the rates most likely to be achieved by investors (investment return) and the economy (inflation rate) in next 20~30 years. BTW, economists rarely got those predictions right in advance. 1. How much percentage is consider healthy for income ratio. I think 70% is good. The reason is I expect social security income make up 30% of the post retirement income. 2. Recommend adding matching contributions by employer % and % investment growth per year of investment. Will consider this. As a workaround, currently one can simply add the employer matching % to the saving % in the input tab. No workaround for growth of investment growth if we talk about the growth yearly retirement account contribution. 3. The app did not say whether it’s spending principle or not. The app assume the balance becomes zero at the end. Tell your children don’t expect a windfall. With that in mind, make sure your retirement income covers your spouse. If you have any questions or comments regarding this product, don’t hesitate to contact us via email “uudaddy (no spam) AT gmail DOT com”. Or you can leave comment below using DISQUS (note others can read the content if you leave comment using DISCUS. So email us if you like to have more privacy.